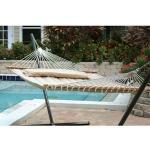 Lay back and get cozy in the Stansport Acapulco Single Person hammock. Sink into the 47" by 78" bed and swing your worries away. The Stansport Acapulco Single Person hammock is made of durable cotton and the strong attaching ropes will last for many seasons of use.